Also serving communities of Coleraine, Bovey. There are 15 Assisted Living Facilities in the Grand Rapids area, with 12 in Grand Rapids and 3 nearby. The average cost of assisted living in Grand Rapids is $2,385 per month. This is lower than the national median of $3,345. To help you with your search, browse the 8 reviews below for assisted living facilities in Grand Rapids. On average, consumers rate assisted living in Grand Rapids 3.8 out of 5 stars. Better rated regions include Chisholm with an average rating of 5.0 out of 5 stars. Caring.com has helped thousands of families find high-quality senior care. To speak with one of our Family Advisors about assisted living options and costs in Grand Rapids, call (855) 863-8283. Grand Rapids, Minnesota lies just three miles north of the Twin Cities on the Mississippi River. This city is well-known for being the birthplace of the famous Judy Garland and hosts a museum in her honor. In addition to its unique American history, Grand Rapids is home to 12 Assisted Living Facilities (ALFs), and an additional five more in the surrounding area. In Grand Rapids, and throughout Minnesota, ALFs are known as housing services are defined by the state as congregate living facilities which offer 24-hour supervision and personal care or nursing services. The Minnesota Department of Health (MDH) is responsible for licensing and regulating these facilities. Violent crime in Grand Rapids is 14.6 out of 100 (1 being the safest), which is quite low compared to the national average of 31.1. Property crime, on the other hand, is 51.9, which is much higher than the national average of 38.1. This could be an issue for some seniors and their loved ones. Grand Rapids is home to lush scenery and very comfortable summer weather. With a high of 79 degrees Fahrenheit in July, seniors can enjoy the outdoors in comfort. However, a whopping average of 51 inches of snowfall each year and a bitter winter of -2 degrees Fahrenheit in January, may be of serious concern to seniors who cannot tolerate the cold or those with mobility devices. Grand Rapids has a cost of living that’s 3.9 percent lower than the national average. This lower cost of living may live more room in seniors' budgets for daily living costs and entertainment. The city of Grand Rapids is bursting with things to do. Seniors can visit the Judy Garland Museum to learn about the famous actress’ birthplace and early life. For those who enjoy the outdoors, the Forest History Center and Scenic State Park are good options. The Grand Rapids area is home to world-class medical facilities, including Grand Itasca Clinic and Hospital, in the event of medical emergencies or illness. Grand Rapids is a member of the AARP Network of Age-Friendly Communities, meaning that its elected leadership “has made the commitment to actively work toward making their town, city or county a great place for people of all ages,” according to AARP. Assisted Living costs in Grand Rapids start around $2,385 per month on average, while the nationwide average cost of assisted living is $4,000 per month, according to the latest figures from Genworth’s Cost of Care Survey. It’s important to note that assisted living rates in Grand Rapids and the surrounding suburbs can vary widely based on factors such as location, the level of care needed, apartment size and the types of amenities offered at each community. 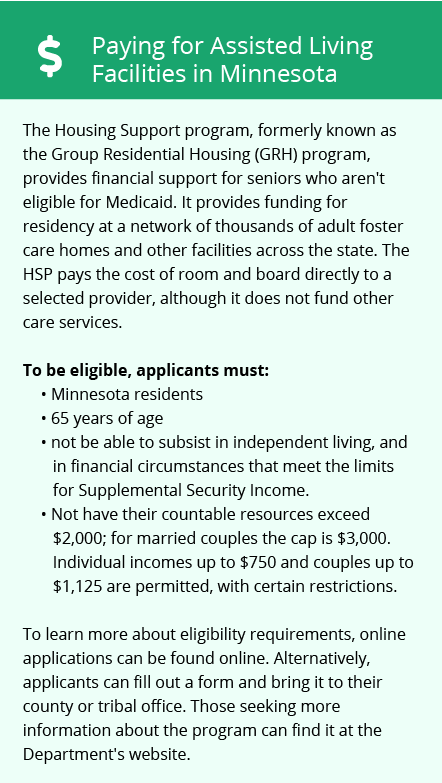 Minnesota offers financial assistance for eligible seniors seeking financial aid to cover assisted living costs. Medical Assistance (MA), the state’s Medicaid program offers managed care programs for those in residential settings. 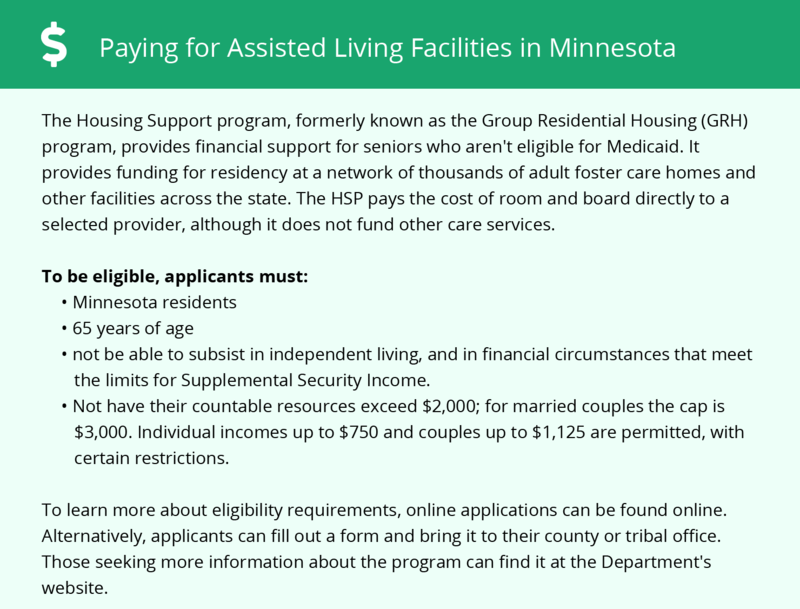 State programs such as the Group Residential Housing program also offer aid to eligible Minnesota seniors who do not qualify for Medicaid. Grand Rapids and the surrounding area are home to numerous government agencies and non-profit organizations offering help for seniors searching for or currently residing in an assisted living community. These organizations can also provide assistance in a number of other eldercare services such as geriatric care management, elder law advice, estate planning, finding home care and health and wellness programs. To see a list of free assisted living resources in Grand Rapids, please visit our Assisted Living in Minnesota page. Grand Rapids-area assisted living communities must adhere to the comprehensive set of state laws and regulations that all assisted living communities in Minnesota are required to follow. Visit our Assisted Living in Minnesota page for more information about these laws.